Ruhunu University Students' Union President Harsha Gunawardene was attacked by an unidentified group Wednesday night (January 16). IUSF said that the attack was carried out around 9.30 p.m. by 10 masked men who were arrived in a green defender jeep. Those masked men tried to kidnap students’ leader and after failed they have been attacked using iron bars. 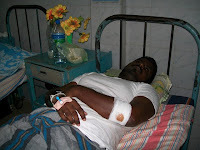 He was admitted to the Matara General Hospital due to injuries. Police said that investigations are underway.